If Peter Clark’s report on Winter Institute was any indication, the bookselling community is hardly feeling complacent in the face of the drastically shifting American political landscape. 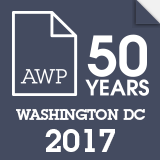 The same thing can certainly be said of the larger literary community, many of whom will be descending upon—of all places—Washington, DC for the annual Association of Writers & Writing Programs (AWP) conference this week. On Thursday, around 12,000 writers, college and university creative writing programs, literary journals, and independent publishers will gather for three days of presentations, reading, panels, lectures — and political demonstrations. A large number of attendees are planning to take a break from literary activities to protest Trump’s agenda while they’re in the capitol. As Flavorwire’s Sarah Seltzer reported last week, over 1,000 people have signed up on Facebook to attend the Writers Resist Trump demonstration on Capitol Hill on Friday. Meanwhile, on Saturday, almost 800 people will be gathering outside the White House for a Candlelight Vigil for Free Speech, organized with the support of the writing programs at Kansas State University, the University of Colorado, and the University of Miami, among many others.